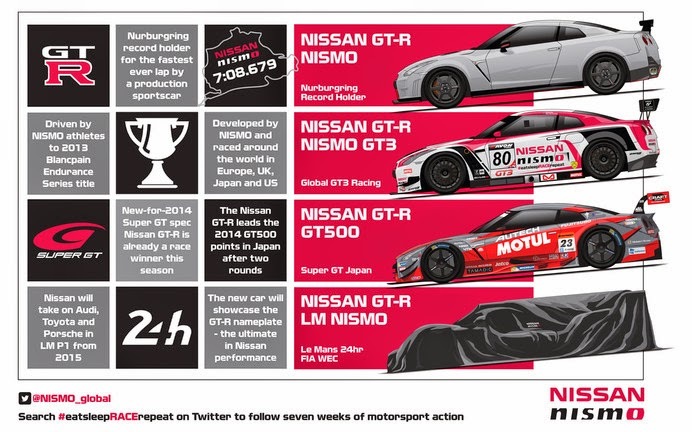 LONDON – Nissan will unleash the GT-R and go head-to-head with Audi, Porsche and Toyota at Le Mans in 2015. The Japanese manufacturer will also contest the 2015 FIA World Endurance Championship with a full factory effort of two LM P1 cars. Nissan's LM P1 car will be called the Nissan GT-R LM NISMO, carrying on a sporting bloodline that stretches back 30 years and recognizes the company's flagship road car, the Nissan GT-R.
Nissan's LM P1 program was launched in the heart of Europe's fastest-growing area of digital innovation in East London, close to Nissan's new global digital hub. Automobile Club de l'Ouest (ACO) President Pierre Fillon joined Nissan's Chief Planning Officer and Executive Vice President Andy Palmer, NISMO President Shoichi Miyatani, and NISMO Global Head of Brand, Marketing and Sales Darren Cox for the announcement at the Old Truman Brewery in Brick Lane, London. "Innovation is at the heart of everything we do," said Palmer. "There is no better place to demonstrate innovation than here in Europe's new hot-bed of digital marketing and, from next year, on track at Le Mans. We have chosen this venue – and made it a celebration, rather than yet another press conference – to reflect the fact that when we go racing, we do so differently." As innovators in sports marketing, Nissan Motor Corporation deliberately took a non-traditional approach to F1 with its prestige Infiniti brand through its association with Red Bull Racing. Outside motorsport, Nissan is an official partner of the UEFA Champion's League with a new four-year deal. Fittingly, the Champion's League final is this weekend, and fans can expect to see a new approach to Nissan's sports marketing initiatives within the "beautiful game." Nissan is also proud to be the Official Automotive Partner of the 2016 Olympic Games in Rio. "We applaud the ACO and FIA for the work they have done to get the rules right," continued Palmer. "LM P1 is not just an arms race. All our rivals in the class have taken different technical approaches, and we will be doing the same. We want to win in a very different way to that of our rivals. We won't be turning up in a vehicle, which is a basically another hybrid that looks like another Porsche, Audi or Toyota – they all look the same to me. Our intention is to do something that is a little bit different." Nissan has steadily increased its participation in motorsport in recent times through innovative programs, such as Nissan PlayStation GT Academy and the ACO's Garage 56 initiative. "Nissan is connecting in motorsport in many ways through its performance arm, NISMO," said Cox. "In recent years we have taken a new approach to motorsport – not racing for racing's sake – but carefully considering our reasons to engage with our global competition." The Nissan GT-R NISMO GT3 now races all over the world, not least in Europe where it is driven by the NISMO Athletes, the winners of GT Academy. Nissan's LM P2 engine is the standout P2 power plant in recent years and the company's commitment to the ACO's Garage 56 initiative demonstrates its love of a technical challenge. What Nissan learns on the track is fed through to its road cars to deliver technical innovation across the product range. "Marketing innovation is important to us, and Le Mans is an incredible marketing platform," continued Cox. "We are a big, passionate, innovative brand that wants a presence on the world stage. NISMO isn't just a big building in Yokohama full of top-level motorsport talent. NISMO stands for everything we love about racing. This year we have four gamers racing at Le Mans and, now that Sir Chris Hoy is racing with us in British GT and learning the ropes, we will be taking an Olympian to Le Mans in the future." The new Nissan GT-R LM NISMO gives Nissan the opportunity to return to Le Mans where the company has some unfinished business. "The design and build of the Nissan GT-R LM NISMO is a global project with its DNA firmly rooted in Japan," explained Miyatani. "The team comprises engineers and technical crew from Japan, the U.S. and Europe. We know that LM P1 competition is very tough, with serious manufacturer competition, but we are absolutely determined to make our cars competitive and to operate strongly against those competitors. "We have chosen to take the GT-R name to Le Mans as the GT-R symbolizes the ultimate in Nissan's performance. It is a true aspirational brand – a car our fans, our customers love to drive, and love to own. We have been using GT-R in motorsport for many years now, in Super GT and GT3. For us LM P1 is the ultimate test. We have unfinished business at Le Mans, and now we have our chance to target victory with the Nissan GT-R LM NISMO." Nissan is accessible to the racers and to motorsport fans. Over the next six weeks, NISMO has vowed to #eatsleepRACErepeat, a campaign designed to engage with the fans or motorsport. NISMO.TV continues to produce outstanding access-all-areas films and live streaming to fans, and at Le Mans the channel will broadcast live from the NISMO-sponsored Le Mans Village, taking the spectators right to the heart of the action. The race is now on to get Nissan's LM P1 car on the grid in 2015. 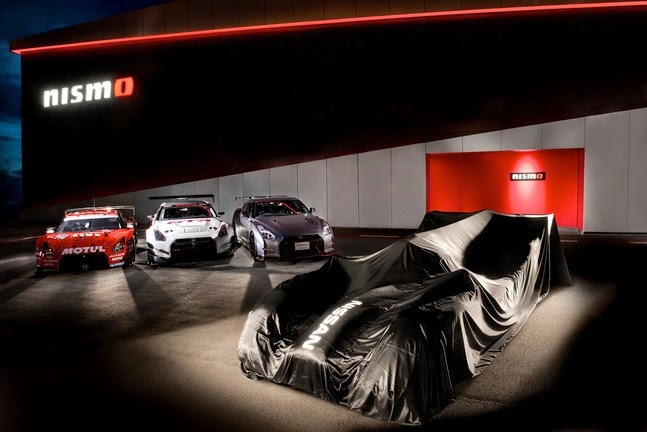 Announcements will be made in due course concerning the drivers of the Nissan GT-R LM NISMO, who will come from both inside and outside of the Nissan family. The date the new car will first take to the track and the full technical specifications will also be revealed in due course, but the intentions of Nissan are clear. "You don't go to Le Mans to just turn up," said Palmer. "The brief to the team is to go with something different. Go with something that brings new technology, which is transferable to the road car technology and an approach that is innovative and exciting, and of course, go to win. "Believe me, I think this is the car that will go down in the annals of time and be one of those cars which will be long remembered, not only for the fact that it will have won Le Mans, but also that it reset the real meaning of NISMO as a link between success on the track and success on the road." A NUMBERS GAME FOR NISSAN? The LM P1 program was announced on "23" May, which could in itself prove to be a good omen. In Japanese pronunciation, 2 is "ni" and 3 is "san," so 23 is Nissan's lucky number. In addition to this, May is the fifth month of the year, and the Japanese write May 23 as 5.23. The numeral "5" is "go" in Japanese, so May 23 appears as "Go, Nissan!"